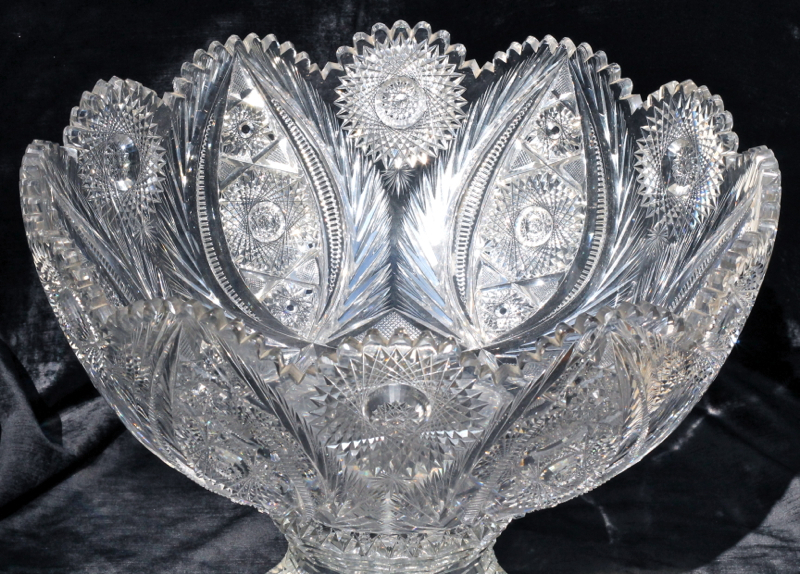 This is one of the largest punch bowls I’ve ever seen and certainly the largest I’ve ever offered for sale. 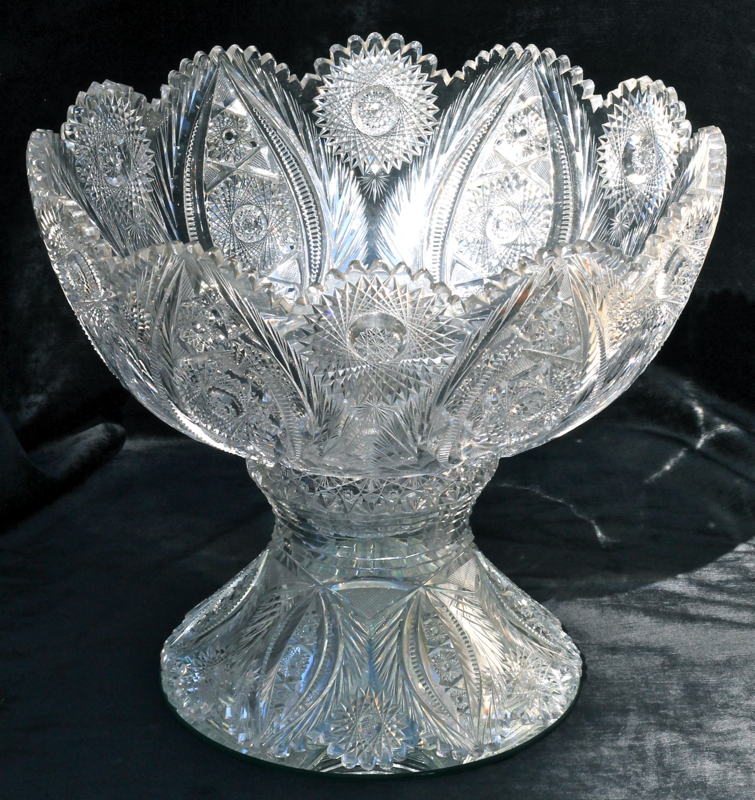 It was cut by American Cut Glass Company (owned and operated by William C. Anderson) in their glorious Anne design. They held all the stops on this one – in both size and attention to detail. Six large vesicas expand towards the edge of the bowl. Each is filled with three hobstars – two with jeweled centers and the middle one being a stacked wedding-cake style. Each vesicas is framed with notching and then a layer of feathering which eventually run into a triangle of crosshatching. 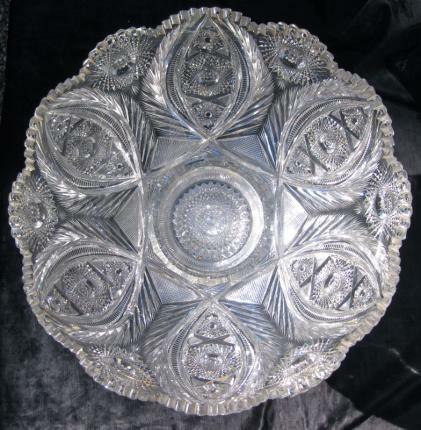 Lying between the feathering motif is also a large hobstar at the edge of the bowl. 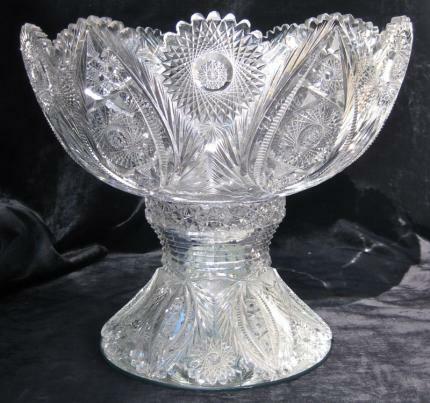 The knob of the punch bowl should be noted-not only is the edge angled and cut with parallel lines, but the center is extremely complet-featuring a 5 miter-hobstar center. 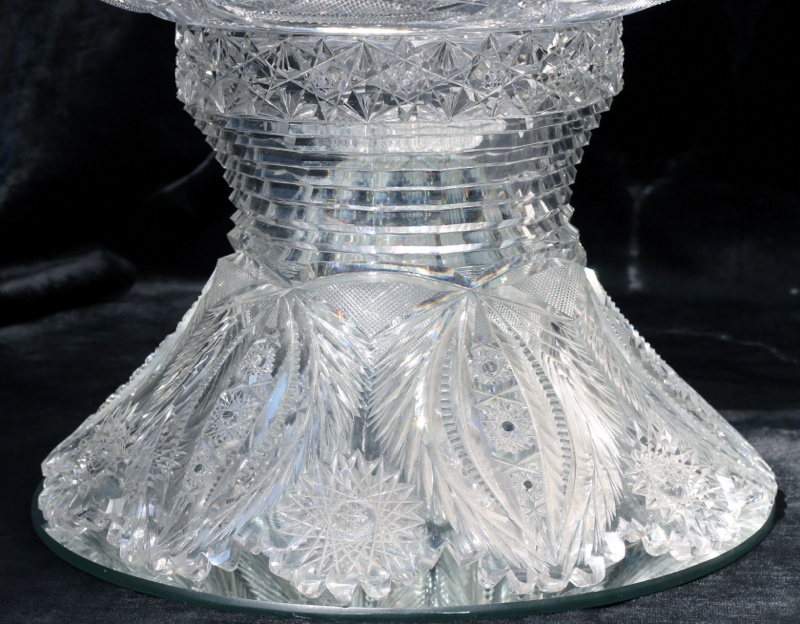 The pattern repeates itself on the base with step cutting leading up to the neck. 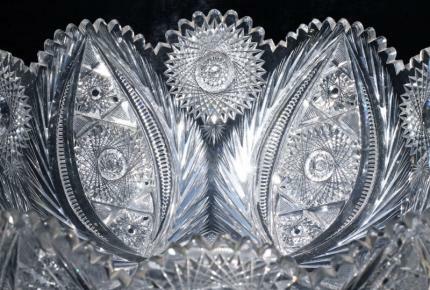 Rather than a normal faceted, or strawberry-diamond neck ring, this has deep Persian cutting all around the collar. The punch bowl is in immaculate condition and measures 18 1/2″ wide and 16″ tall. 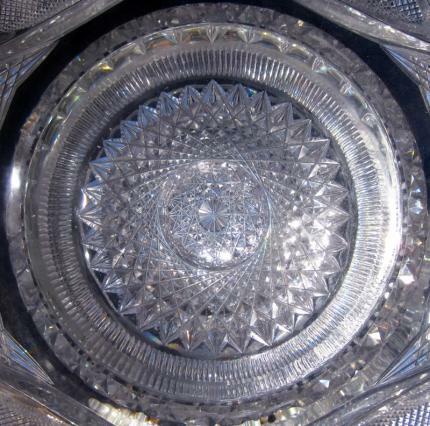 The massive piece weighs in at 42 pounds and is on a wonderfully clear blank. Punch bowls in this size are virtually unheard of and most,aren’t this nice. 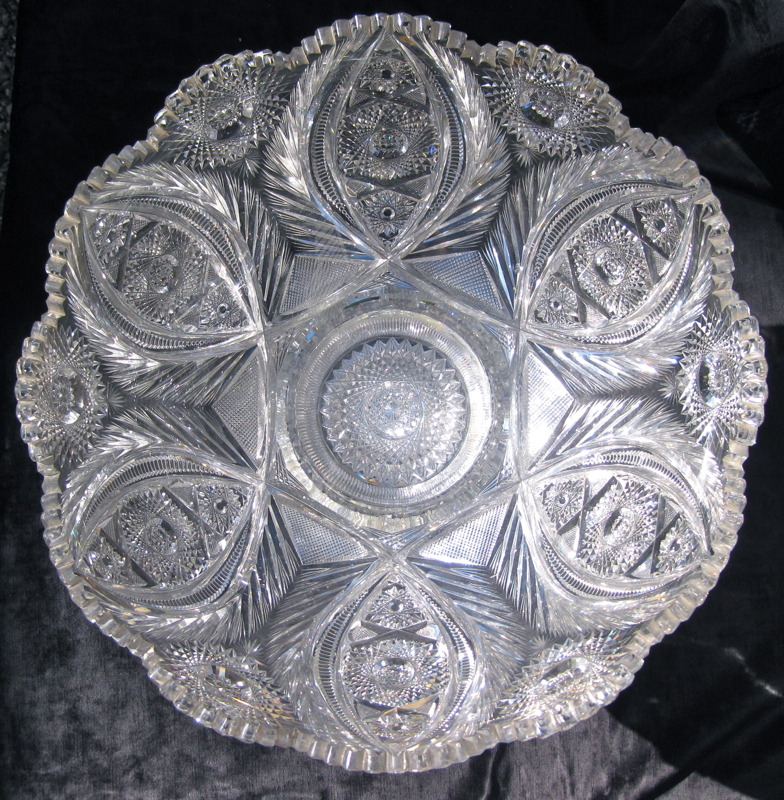 It’s amazing that this piece survived production, much less 115 years on this planet!